Some records encircle your senses before making their mark, while others don’t hesitate with the impact. 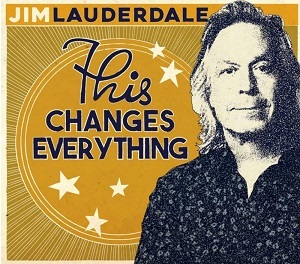 Needless to say the brand new album from Jim Lauderdale wasted no opportunity with a straight off bulls eye appeal, but that will hardly be news to the legions of country and Americana fans endeared to this acclaimed legend. THIS CHANGES EVERYTHING ensures that Jim hasn’t rested on his laurels especially with the latest round of appreciative award giving at the recent Americana’s.Without any doubt the eleven tracks whisk you down Texas way and whirl around the state regardless whether you are a resident or live thousands of miles away. Before any further comment is made, attention must be drawn to the absolute gem of a track ‘All the Rage in Paris’ nestling right at the album’s core. This Jim Lauderdale/Daryl Burgess co-write saw the light of day a few years back with multiple cuts and its re-issue in 2016 can bring it a new audience. Tongue in cheek maybe, far from subtle in its namedropping and sentiment, this song drools in Texas gold (not the black stuff) and escalates right into the best song re-issue nominee category for the year. Serious addiction to this track is far from bad for your health, in fact look at it as a casual remedy to your minor woes. Jim may not be a native Texan, but he has dipped right into the heart of the music scene to enlist a talented band of helpers to bring this record to fruition. Under the guidance of Tommy Detamore, and largely recorded in Austin in a single day, all eleven tracks had the five star treatment from an exalted list of musicians including some electric guitar input by Chris Masterson and vocals by the trio of Noel McKay, Brennan Leigh and Sunny Sweeney. While Jim had at least a co-write share in all the songs, some others have also materialised elsewhere notably the George Strait 90’s hit ‘We Really Shouldn’t Be Doing This’ and more subtly ‘Drive’, the lead track from Hayes Carll’s latest album LOVERS AND LEAVERS. Two cuts have come from the combined pens of Lauderdale and Texan song writing icon Bruce Robison including the title and opening piece ‘This Changes Everything’. The ultimate affection for this album is that it captures the charm of old time country meets Western Swing meets a sound right to the very core of what attracts folks far and wide to a style epitomising a region. The album is released on Jim’s own Sky Crunch Records and is set to match up well with his extensive back catalogue, now running into the high twenties. Apart from the standout track eulogised about earlier, the strength of the album is in the entity and multiple plays are guaranteed once your ear is tuned in. Whether you are taken by the swing influenced ‘You Turn Me Around’, smitten by the crooner ‘It All Started and Ended With You’ or seduced by the classic country tinge to ‘The Weakness of Two Hearts’, the album will barely need a second chance to impress. 2016 is set to be as relevant a year for Jim Lauderdale as any of the previous thirty since he set out on this path to make fine distinguished music. This well produced and totally infectious album can have a short term legacy of reaching out to new listeners ripe to be hooked on country music made the Texas way - and made very well. THIS CHANGES EVERYTHING is likely to thrill the devotees, with that little extra reach out maybe making a greater impact on steering future generations in the right direction.